Looks like your browser does not support video content. On this day, 14 years ago, Jellyneo was born! Back on opening day, we had nothing but a few "Viewer" scripts that allowed you to scroll through things like Caption Contest images, userlookup shields, and Neopet poses (which is the only one we still have around!) It took almost a month for us to get a few articles up, which only included simple things like Cheeseroller and Illusen's Glade. Today, we're a bit bigger! Thousands of users like you and over 200 staff members have helped build up what you now know as Jellyneo, which includes: a complete Item Database, the only destination on the 'net for Neopian history and lore, an app to try on any wearable, the premier guide to the Battledome, a searchable, categorized listing of over 135,000 Neopets images, not to mention a massive repository of guides and articles for any Neopets feature you can probably think of. And all of it is done to help you, our fellow Neopians. Here on the main site, we're excited to announce that our Goal Counter service has been revamped! For those who haven't used our service before, Goal Counters allow you to track your progress towards your Neopian goals. You simply create your counter once, insert the code we provide once on your lookup, shop, etc., and then return to Jellyneo to update your progress which automatically updates wherever you placed the code. We've re-written the backend from the ground up, which has allowed us to open up the number of counters that you can create from 5 to... as many as you want! We changed the way that URLs for the generated counter images work so that your username is no longer in the URL, which will give you some added privacy. The old counters will still keep their old URLs, so if you'd like to have a new URL simply delete your counter and re-create it. It wouldn't be a Goal Counters update without some new counter styles! First up in the Item Database, is a new Hidden Tower Price Guide. We've put together a list of all the Hidden Tower items currently for sale and their prices, including the various discounts you take advantage of. We also show the Jellyneo market price if we have one on file and highlight whichever one is best so you can make an informed purchase. The price guide can be found in under the "Content" dropdown in our Item Database. Our Classic Neohome previews have finished being updated! All Classic Neohome items now have standard previews. Added automatic notations on all items that will make Kyriis sick (apples). Added automatic notations on all items that will make Skeiths sick (cheese). Added automatic notations on all items that will make Pteris bloated and cured of any disease (worms). Added automatic notations on all items that will make Kaus bloated (milk). The ability to sort results by URL, width, height, category, and when it was added to the database. Along with the new sorting, you can sort either forwards or backwards! We added a new "Is Animated?" checkbox search option for you to filter by images that are animated. We did some tidying up and now your search pages won't have long, gross URLs—instead it'll just be what you searched for. The Emporium homepage has also received a little update to show a wider variety of random images! Obviously, a lot of Neopets content was created with Adobe Flash. The Neopets Team is hard at work converting various features across the site to "HTML5" (which is a word Neopians have co-opted to mean "not Flash"), such as the world maps and some of the existing Flash games. However, not all content will be converted—or will even be worth TNT's time to convert! That's where we've decided to step in and do some archival work. We've been working to streamline a SWF conversion process, and we're finally ready to begin work on preserving old Flash content! We wanted to start off with something simple, so we took all of the old Flash-based sidebar button advertisements you may remember from the old Neopets layout, and we converted them to a modern movie format! Our first converted SWF collection is now ready to view, either in grid format or nostalgic sidebar format! And that's it for our birthday update! Enjoy some cake, and here's to another 14 years of Neopets help! Lots of cool things announced, but I'm especially excited about the SWF Preservation Project! Thank you for all you do and have done. And especial thanks for the SWF Preservation Project! Happy Birthday Jellyneo! You're all doing such great work! Happy Birthday and thank you so much, you're full of awesomesauce! Thanks so much for all you do! You are all heroes to me and to many others!! That is an amazing list of things you have done recently! Here's to many more years! I was waiting for the goal counters to drop it's limit ever since I suggested to Dave that the minimum should be raised as a perk to Jellyneo donators. Can't wait to clutter up my goal counter page!!! Awesome new perks! Thank you! The reason I started making goofy comments on your posts was because I love seeing goofy comments in general. I always loved seeing clever, witty, or funny things when I look in the comments! It's one of the reasons I read them. I hope my goof-ball-idy might've made your comment sections more active. <3 Thank you for all the info you've supplied over the years! Happy Birthday Jellyneo! It's your birthday and WE get presents! Thank you to the entire staff, present and past. RIP Old JN Negg Hunt Portals. ^Will there even be another JN Negg Hunt? Scout and I were discussing this two posts down. Dave and I have talked about it before and it's not off the table, but there are other projects to focus on before it can happen. Joyeux anniversaire!!! And thanks for all the fantastic work the whole team is doing! You have great additions, this time again! You are simply amazing! @rosiethorns88 - As long as it's on the table! Thank you! Aww Happy Birthday, JellyNeo! I remember being on staff like it was yesterday! @1jediboy: As Rosie said, we're never saying never to more Negg Hunts, but our current goal is to get the main site layout revamped to match the Item DB, Book of Ages, and DrSloth.com. Once that happens, we'll consider another Hunt! @Dave - SWEET! I can wait. I'm patient... And grateful of what was already given! Love the idea of the SWF Preservation Project! @1jediboy: Please, continue to make goofy posts! It's because of those funny moments that I discover how it was great and useful to read the comments! Thank you! *blushes* Enjoy the party! Oh this is all so lovely! I love that you're converting those old SWFs. Do you think you could archive the old Sacrificer animations too? I was looking through those sidebar adverts and honestly some of those could make for cute avatars, haha. Would love one of that revel roundup ad with just a looping avatar of marching snorkles. Happy Happy Birthday to you JN! Happy for us you have been here for us all these years and how you have made neopets more fun! Thank you!!! Happy birthday JN!! You guys ROCK! Happy Birthday and thanks for all you do for the Neopets community! I'd be lost without you guys! Fabulous job. I do not know where I would be without you guys. Happy Birthday. Happy Birthday JellyNeo! Thank you so much to all you wonderful staff for all you do. I appreciate you all so much! Have a good one JN. What about the forums, though? I'm so glad you guys are here. The effort that you put into your site is second to none as far as results and resources. This game opened like a pop-up book for me once I found your site, and I'm on it every day. Thank you, thank you, thank you!! Glad to see you guys archiving SWFs on JN. This is a good solution. I hope you guys do the other ad types too. A few of them had unique Neopets artwork. And thank you for exlcuding the ones that are not unique to Neopets. There are hundreds of them. I'm so glad you're preserving the swfs!!! It was my birthday yesterday, too! Happy Birthday Jellyneo! Thanks for all you do, you're the greatest! flash itself is not ending, its the flash player thats ending in a browser. anyways are you planning a similar thing for petpet park, as our group has a lot of the files from it working or archived lately. We now have the file that loads all of the petpets actions working with a petpet even. You can find most of the base files at archive.org like we did. @twilson1118: It's true that web browsers are ending support, however, Adobe has also announced that they will end support and development on Flash as a platform in 2020. So, it will truly die in about 2 years time. 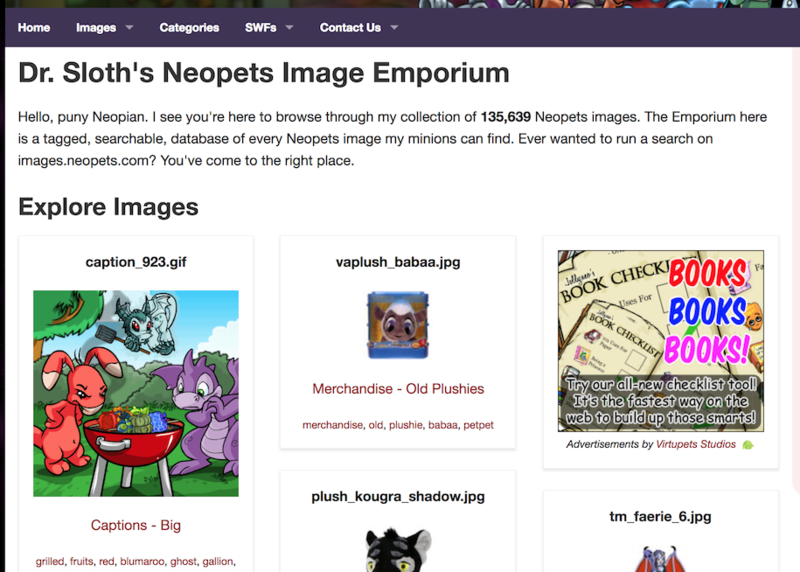 We currently have no plans to archive Petpet Park assets, as our attention nowadays is solely on Neopets proper. thats fine as petpet project is doing a lot of that archiving, so if you had any ideas....we actually have all of the animations running from the park, and oddly enough many of the fruits your missing on the games we have images of at petpet project if you need them for bonbon pickup, we actually have the FILE for that game and it sort of plays even. There are 66 comments above. Why not post yours?